Time to sharpen those addition skills and help Spot get to the Blastership! ‘Adding Along the Way’ is a fun addition worksheet for kids. Free and printable, this worksheet can be used by homeschooling parents and teachers to give 1st and 2nd graders some math practice. 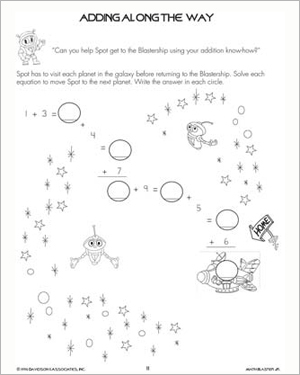 All that the little ones need to do is answer correctly all the math problems on the way to the Blastership and get Spot to his destination!